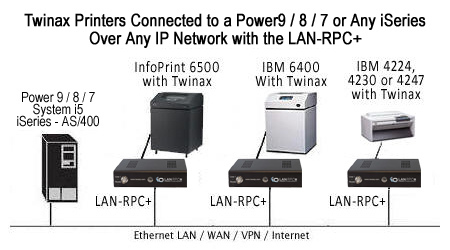 The I-O LAN-RPC+ Twinax-to-IP Print Server connects any Twinax printer over IP to any new IBM Power9, Power8, Power7 and all models of Power Systems, iSeries or AS/400s over IP. You can continue to use the investment you have in your existing Twinax printers. The LAN-RPC+ is the replacement for the original LAN-RPC. and supports the connection of 1 Twinax Printer over an IP connection. If you need to connect more than 1 Twinax Printer or have Twinax Displays you need to connect as well, the Xip+ Twinax Controller will be the better option for you. There are models that will support from 7 to 42 Twinax Devices/Addresses. You simply connect your Twinax printer directly to the I-O LAN-RPC+. and connect the LAN-RPC+ to your network as with any print server. With the LAN-RPC+ your printer will have the same Print Queue control you have now with the printer connected directly via a Twinax connection. The attached printer can be any Twinax laser, dot-matrix, line printer or thermal label printer. Line and matrix printers connected with TN5250e IP Protocol, AnyNet or SNA on an AS/400 offer page range printing support and posting of the FORM ALIGNMENT messages. The latter is a particularly valuable feature when printing on pre-printed forms or stationary such as checks and invoices. With I-O�s Configuration Utility, the initial setup and configuration is a painless and straight forward task. Once an IP address has been assigned, administrators can easily configure multiple I-O print servers directly from their desktop. These can be locally or remotely attached. *Note: Must have OS/400 V3R2 or higher. Investment Protection Reliable and expensive Twinax printers are given a new lease on life by connecting over IP Ethernet. Auto-configuration SNA and AnyNet protocols allow the AS/400 to automatically recognize Twinax attached SCS printers. TN5250e, AnyNet and SNA Support Page Range Printing and form alignment messages for line and matrix printers. PPR/PPD AFP/IPDS printers are connected to the host via true TCP/IP protocol. Configuration Utility Simple configuration of the LAN-RPC+ from a PC on a local or remote network. 10/100BaseT Auto-Sensing Automatic adaptation to your network speed requirements. FLASH Memory Convenient field-upgrades to take advantage of the latest enhancements.